2014 Topps Five Star Baseball is all about high-end hits. Due to its price tag, it won't be for everyone. However, it delivers a lot of autographs (all are signed on-card) and other premium cards. Boxes come with six hits, at least five of which are autographs. The bulk of the signed content comes in the form of numbered Active/Retired Player Autographs. The design is somewhat minimal, focusing primarily on the player and a large signing area. 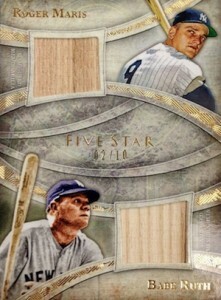 Parallels include Rainbow (#/25) and Five Star (1/1). Silver Signatures (#/50) have a dark design. Autographs are done in silver ink. 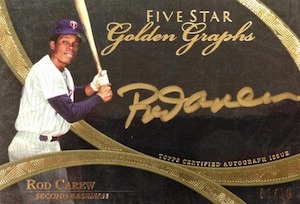 Similarly, new Golden Graphs (#/50) take the same general concept but have gold-ink signatures. Both have six levels of parallels, none of which are numbered any higher than 25. 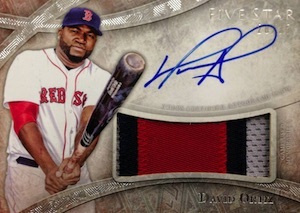 Five Star Autographed Jumbo Patches (#/35) come with Gold (#/10), Rainbow (#/5) and Five Star (1/1) parallels. 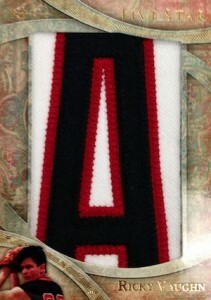 MLB Silhouetted Batter Logo Patch Autographs are all one-of-ones. 2014 Topps Five Star Baseball also has a trio of book card sets. Dual Signature Patch cards (#/10) come with autographs and patches from a pair of players. Four-Piece Signature Book cards (#/50) have four relic pieces on one side and an autograph and player image on the other. 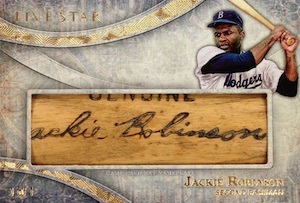 Autographed Jumbo Relic Book cards (#/50) are highlighted by large memorabilia swatches. Four-Piece Signature and Autographed Jumbo Relics have Gold Patch (#/10) and Five Star (1/1) parallels. 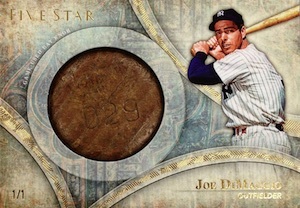 Legends Relics (#/25) feature memorabilia from all-time greats. 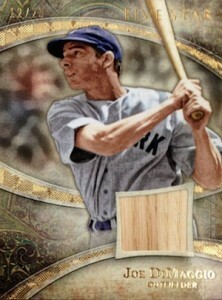 Dual Legends Relics (#/10) come with pieces from a pair of retired players. Other high-end rarities in 2014 Topps Five Star Baseball include Letters (1/1), Bat Knobs (1/1), Bat Plates (1/1) and Cut Signatures (1/1). God those lines running through background make the design ugly and distract from both the player image and the autograph or relic featured. High price for these boxes and the potential to get 4 or 5 autographs worth about $10-$15 each, WOW! The product like last year looks great and the on card autos very nice. That being said, the checklist is awful for the price. Terrible. Can Topps ever release a product without an abundance of Taijuan Walker or Nick Castellanos? Good grief – Chris Sabo? Orlando Hernandez? Matt Adams? CJ Wilson?!!! Never would have bought a case if I saw the checklist in advance. A five star product should not have cards numbered to 499! A lot of low end players on the checklist. For the price it should have at least 1 big hit per box. 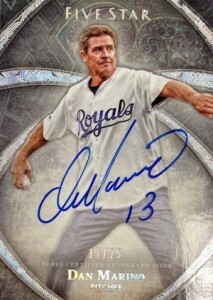 Another Topps failure, but then again they dont care since the dealers have to pay up front for the product. The number of “super high-end” Baseball releases have multiplied at an exponential rate. Lastly, Oscar Taveras autos in yet another product? That borders upon the super-unethical and I’d be livid to be a victim of a blatant Auto dump. As far as high-end cards go, it’s mediocre. I just bought and opened a case. I don’t think any of the cards would grade higher than a 9. They are pretty, but I doubt I’d buy again. That being said, I’m ecstatic. I pulled the Hank Aaron Bat Knob. Anyone have a clue of what it might be worth? Not a fan of them changing the format (for both sports). I liked the duals and quotables. Not sure why there’s a need for both Golden and Silver autos, and why the checklists are very similar. I would think either completely different signers in each, or all the same. Plus, do we really need 5 parallels, with only a 5 difference in numbering (/25, /20, /15, /10, /5)? Ryan, do you know if the three football guys have base autos? All I’ve seen are the Rainbow /25 parallels. MeetJSquared � Not sure on the football guys. Haven’t checked into them much. I suspect they’d be tougher to get. Jeez..the only people who leave comments on these boards just ” b***h, b***h, b***h” … I read some reviews of supreme and the problem was sticker autos….now the autos are on card and they find something else to b***h about….I think its apparent the real reason is the price point. That being said…you don’t have to buy the if you don’t have the money! Stick with regular Topps! Like this product. Love the thick card stock. That and watching some amazing pulls on you tube are what finally lured me into the newer High End product line. (up to this point, i’ve just been a vintage collector) To me, at this point Topps is the only way to go. I just don’t like the other products that can’t use MLB logos and names. This is going to be a fun set to try and build (over several years of course). My only real complaint is the silver sigs and golden graphs lineup doesn’t have any high value players i.e. Trout, Harper, or even some High dollar retired names. I’ve learned quickly that when i see one of those cards… it’s probably going to be a weak box. Most of my collection will be built via ebay but i’m sure i’ll be ripping into a few more boxes in the future. After watching breaks of this product and seeing how every box was either boom or bust(more busts) I decided not to risk it and just buy singles. I love the design, thick card stock, and on card autographs. This is the ultimate singles product for me. Wrong. Those lines are curved in such a way as to LEAD the eye to the player and the patch! As a designer myself (websites), I can attest that this is a very solid design. It’s fine if you think it’s ugly. Just don’t make stuff up that is untrue. High five! How about it! If the supply is lower and the demand higher, prices will go up. If supply is higher and demand lower, prices will come down. If supply is lower and demand is lower, the market is stabilized. If supply is higher and demand is higher, again, the market it stabilized. Topps is a corporation that’s been in business for 60 years. They literally are experts in the trading card industry. If the ultra high-end cards were not selling, they would not be producing them. They sell out, and sell out rather quickly. That tells them those types of cards are in high demand. If they produce a limited run of ultra high-end, and they are seeing demand is hot….where do you think the prices will go!? Just like with the secondary market with individual sellers, they are going to attempt to maximize the dollar amount for the products they sell. I mean, seriously, why shouldn’t they? Very ironic, or rather hypocritical, that people who want to flip cards for a profit will criticize another entity for wanting to do the same thing. Only, if Topps and Pannini, and what have you were not making profits, they would not be producing cards. If nobody were producing cards, you wouldn’t be getting your hands on them. If anything, what is annoying are people purchasing a box for $300 and wanting to sell a single card from that box for $3,000! You’re absolutely NUTS! And I am not exactly a big fan of large corporations. After defending a big company like Topps, I feel as though I need to wash my mouth out….